"Buy land," wrote Mark Twain. "They're not making it any more." I hate to be the bearer of bad news, but it's quite possible that the famous author was wrong and that they are making more land. My guess is that Twain never heard of the legal term accretion, which is the gradual increase in size of a parcel of land bordering on a body of water. The increase may be due to the silting up of soil, sand or other substance, or by the permanent lowering of the water level. In order to qualify as accretion, the increase in the size of a parcel of land must almost be imperceptible and cannot happen suddenly as the result of a storm or human activity in dumping fill at a waterfront. Now that it is March, and with cottage season just around the corner we hope it's useful to be reminded that anyone buying waterfront land should always compare the current high water mark with the original high water mark on plans dating back to the 19th or 20th century. If there is a difference between the original location of the waterfront and the current waterfront line, the land between the two lines may belong to the property owner or the Crown. Accretion of land was the subject of an interesting decision of the Alberta Court of Appeal released in January. The dispute arose between the province and a group of property owners on Grandview Bay in Cooking Lake, Alta. Like many shallow prairie lakes, the Cooking Lake shoreline is about 305 metres lakeward from where it was according to the Dominion Land Surveyor in 1902. As a result, the new shoreline is about half the length of the original shoreline and the "accreted" lands form a substantial area. 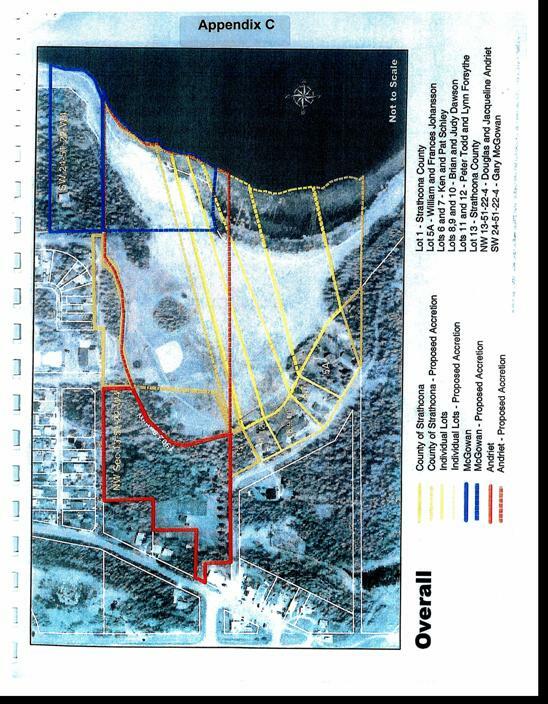 Seeking to maintain their access to the lake, the abutting registered owners sued to claim the accreted lands. Since the horseshoe-shaped bay is almost entirely composed of land now, the claims of the neighbouring property owners overlapped significantly. When the case went to trial, the judge ruled that the property owners had no rights to access the water, and that the 305 metres of land between the cottages and the new shoreline belonged to the Crown. In 2005, the government of Alberta, the county government and several property owners appealed the trial decision. On appeal, the parties all agreed that the trial judge was wrong and that all of the property owners had access to the water. The appeal court also agreed, and based its decision on the wording of the original Crown grant in 1907. That deed gave the original settler various parcels of land "not covered by any waters of Cooking Lake." The appeal court ruled that the lakefront boundaries of the lots "were not as fixed by any survey at a given point in time, but rather changed as the lake receded over the years." The big challenge for the appeal court, however, was to resolve the overlapping claims to the "new" lands and find the fairest way of dividing it. After reviewing the evidence of various land surveyors, the court decided that the accreted lands were to be shared by the waterfront owners. The new shoreline is to be divided up in the same proportions that the owners had in the 1907 shoreline. For anyone interested in buying cottage or waterfront property in Ontario, the lesson in the case of Andriet vs. County of Strathcona is that it is vitally important to know exactly where the current shoreline is and how that relates to the shoreline shown in the original Crown deed. The only way to be certain is to insist on an up-to-date survey report from an Ontario land surveyor. All of the parties named in this litigation, with the exception of the Crown in Right of Alberta (Crown), are registered owners of land in Grandview Bay on Cooking Lake in Alberta. Like many shallow prairie lakes, the waters of Cooking Lake have receded considerably over the past century. The current boundary of Cooking Lake is now about 1,000 feet lakeward from where the Dominion Land Surveyor placed it in 1902. As a consequence, the new shoreline is approximately half of the length of the original shoreline. The accreted lands form a substantial area, which is claimed by the registered owners, each seeking to preserve their access to the lake, and whose claims overlap to a significant degree. Broadly speaking, the appeal involves issues as to whether the registered owners have riparian rights and, if so, how the accreted lands should be allocated or divided amongst them. In addition, the cross-appeal deals with a claim for adverse possession of a portion of the accreted land. The trial judge denied riparian rights, and awarded the accreted lands to the Crown. This decision reverses that holding, and recognizes that the registered owners enjoy riparian rights, including continued access to the water. The registered owners are entitled to an equitable division of the accreted lands, with each maintaining their proportionate share of the shoreline of the lake; their proportionate shares being based upon the length of shoreline shown in the plans as registered from time to time at the Land Titles Office. The determination of riparian rights and an equitable method of allocation must have regard to the Land Titles Act , R.S.A. 2000, c. L-4, and Torrens principles, which are sufficiently broad to embrace, at least to an extent, the common law governing distribution of accreted lands. The expert evidence of surveyors is properly admitted to assist in the interpretation of registered plans, and their professional judgment may be relied upon in extending existing legal boundaries for purposes of allocating the accreted lands. The facts giving rise to this litigation are largely set out in the judgment of the trial judge, 2005 ABQB 848 (CanLII), 2005 ABQB 848. The essential facts relative to the appeal are summarized below. The original Crown grant underlying all the titles to the lands involved in this appeal has reference to a Plan of Township 51, Range 22, West of the Fourth Meridian, Approved and Confirmed by the Department of the Interior, Ottawa, on the 20th day of November, 1906 by Edouard Deville, Surveyor General, compiled from official surveys by ... R.W. Lendrum D.L.S. 17th December 1902" (amongst others). The plan shows most of sections 13 and 24 as being covered by the waters of Cooking Lake. The lands of the current registered owners involved in this appeal all descend, by way of subdivisions and transfers, from this grant. McGowan is the only registered owner of lands in section 24; the other registered owners own land in the northwest quarter of section 13. In the early 1930s, the lands within the northwest quarter of section 13, and within the original grant, were divided into three horizontal strips. The certificate of title for each strip described a parcel of land that was 8 chains wide (from north to south), and that spanned from the western boundary of the quarter section to the easterly boundary; excepting, of course, those portions covered by the waters of Cooking Lake. (For reference purposes, the Andriet lands are in the most northerly top strip, the Plan 2611 E.T. subdivided lots are in the middle strip, and the Mills lands are in the most southerly bottom strip). 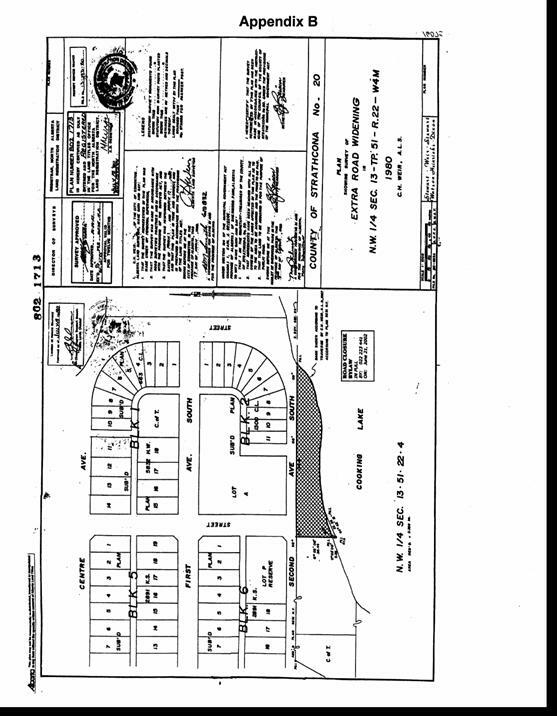 Lots: one(1) to thirteen (13) inclusive block one (1); in Grandview being a subdivision of part of the north west quarter of section thirteen (13) township fifty-one (51) range twenty-two (22) west of the fourth meridian ...[Alberta] ... in the Land Titles Office for this land registration district as Plan 2611 E.T. As the various lots were sold, the purchasers obtained certificates of title that describe their interests merely as a lot number with reference to Plan 2611. It should be noted that lots 2, 3, 4 and 5 have been consolidated into present lot 5A. That [sic] lands bounded by the N Bdy 13-51-22-4, the boundary of Cooking Lake*, and bounded on the west side by a southerly extension of the west boundary of the street right of way (the street referred to is the first street east of main street in South Cooking Lake). *Boundary of Cooking Lake as shown on Plan 5231 NY by C.H. Weir ALS, 1967. The County registered a Road Plan on July 15, 1980, as instrument no. 802 1713, with respect to the lands purchased from the Lerbekmos. It appears that the Purchase Agreement was never registered and that no certificate of title was issued for the lands subject to the road plan. The road plan was registered by way of an exception to lands described as being owned by the Lerbekmos, namely an exception of ...(0.91) acres more or less, as shown on Road Plan 802 1713". A copy of a portion of the plan as registered is attached hereto as Appendix B . The registered road plan shows the boundary of Cooking Lake as being at exactly the same location as the 1967 C.H. Weir survey indicated, even though there was some evidence before the trial judge that the shore of the lake had receded a further distance by 1980. Notwithstanding, the evidence also shows that the survey for the Road Plan was undertaken by C.H. Weir between March 1 and March 17, 1980, and that the registered plan contains a notation that the location of the natural boundary, which can be a reference only to the lakeshore, was approved on July 8, 1980 by one R. Johnson, Director, Program Support Branch, Public Lands Division . Gary Alexander McGowan (McGowan) is registered owner of land in section 24, immediately north of the Andriets land, described by reference to Plan 862 8236. This plan shows the north, east, and south-east boundaries of the McGowan land as a line labelled Traverse of West Bank of Cooking Lake as surveyed by J.J. Hagen, A.L.S., Feb. 1986". Plan 862 2836 was registered at the Land Titles Office on December 18, 1986, and added accreted land to the McGowan lands. The Plan was consented to on behalf of the Minister of Forestry, Lands and Wildlife of the Province of Alberta under section 92.1 of the Land Titles Act on December 16, 1986, and was approved by the head of the documentation section of Public Lands Division, Forestry Lands and Wildlife, on September 18, 1986. Because there was no contention to the McGowan claim for accretion in this quarter section, the trial judge found that McGowan was a riparian owner and entitled to all accreted lands to the east of his property: Reasons for Judgment, paras 21-23. McGowan asserted a claim for title to accreted land south of his property, and within the northwest quarter of section 13, on the basis of adverse possession. The subject land consists of a path and the area within the path, from the southwest corner of his lands in section 24, extending southward in an arch and rejoining his lands at approximately the southeast corner. He alleged exclusive possession and tendered evidence that the path was built, maintained and policed by the McGowan family. In my view the Andriets are entitled to the land as set out in their Certificate of Title which, when read carefully, fixes the easterly boundary as set out in plan 2611ET, which adopts the easterly boundary as found by R.W. Meldrum in 1902. The description on the title to the property has been consistent throughout its history since plan 2611ET, which in my view must be given substantial weight when addressing a boundary issue since the title gives a clear picture of the properties within the boundaries. I therefore find that the Andriets are limited by the boundaries set out in their title and are therefore not entitled to any accreted land as they are not riparian owners. He applied the same reasoning to the other claimants. The trial judge dismissed McGowan s claim based on adverse possession finding that he had not proven, on the balance of probabilities, that he had exclusive possession of any accreted lands in section 13. Given his finding that the owners in section 13 did not enjoy riparian rights, it was not necessary for him to divide up the accreted land amongst them. He declared the accreted land to be Crown land to be dealt with as the Crown sees fit. Issue 1: Do the landowners have riparian rights? All parties, including the Crown, agree that the trial judge erred in failing to find riparian rights. For the reasons explained herein, we accept the common portion of all parties making submissions on this appeal that the registered owners have riparian rights. The interpretation of a title, including whether a parcel of land has a natural boundary, is a question of law, such that the standard of review is correctness. The boundary intended by the patents is quite evidently the actual bank of the river and the mere fact that a further elucidation is attempted by a reference to a plan admitted to have been incorrectly drawn is quite insufficient in my opinion to justify the court in interpreting the grants as really meaning and intending to convey the land, not according to the plan and definitely fixed physical boundary referred to, but according to an arbitrary line erroneously called the river bank, which is not, in fact, upon the ground a river bank at all. All that portion of River Lot Twenty-one (21) of the Edmonton Settlement, in the said Province, lying North of the North boundary of the Dowler Hill Road, as the said Road is shewn on Plan 7258X, of record in the Land Titles Office for this Land Registration District. This boundary line must, therefore, be determined by the rules of law and the construction to be placed upon the plan. A plan of land abutting on a river which shews the east and west boundary lines of a lot as running northerly to the river line and having no defined northern boundary, is, in my opinion, to be considered as having the river (i.e. , the edge of the river bed) for the northern boundary of such lot. If, on a survey of Lot 21, the east and west boundary lines had stopped short of the river bed, there would have been a piece of land between the northern limit of Lot 21 and the bed of the river, in which case it would have been necessary for the surveyor to define the northern boundary of Lot 21. Not having done so, the presumption, in my opinion, is that the river was intended to be the northern boundary. In this case, I interpret the title documents to show the shore of Cooking Lake as being the natural boundary of the subject lands. The boundaries were not as fixed by any survey at a given point in time but rather changed as the lake receded over the years. In this regard, my interpretation is consistent with the unanimous opinions of the expert land surveyors, who gave evidence at trial that the undulating or curvy lines, as drawn upon the surveys, indicated that the lake shore was the natural boundary and therefore, the owners enjoyed riparian rights. It is evident that the Supreme Court of Canada in Clarke had regard to such expert views at para. 34. The trial judge appears to have ignored, without explanation, the expert evidence which he admitted at trial. Issue 2: What are the principles to be applied in dividing the accreted lands? The various claims of all the parties overlap extensively, such that none of the visual survey techniques can offer up a rational solution to the competing claims. The claims for the accreted lands substantially overlap one another. A copy of a portion of trial exhibit 9 is attached as Appendix C hereto. This exhibit is a series of coloured diagrams drawn on an aerial photograph. The overlapping claims of the registered land owners are shown by the exhibit. The exhibit tends to confirm the adage that a picture is worth a thousand words. The difficulties in dividing the accreted land undoubtedly were the source of a proposal put forward by McGowan that all parties hold the accreted lands as tenants in common, thereby ensuring their continued access to the water and perhaps, also enabling the lands to be shared for community use. Common ownership may provide the best solution; however, I agree with the trial judge that it would have to be voluntary and ultimately, registerable. This Court cannot legislate and essentially defeat the riparian rights of the owners to their respective shares of the accreted lands. Thus, the Crown submits that any division by this Court is better than no division at all. I will attempt to provide directions in that regard, in accordance with the principles hereafter outlined. Access to water goes to the heart of riparian ownership. A riparian owner s entitlement to accretion is an incident of the fact that the owner s land is bounded by a body of water such that the land continues to be bounded by the water even when the water recedes. The right of accretion is said to answer the need for a rule of law that accounts for the protection and adjustment of property : Clarke v. Edmonton at 151. The fundamental importance of a riparian land owner s consistent access to the water is evident in Dickson J.A. s (as he then was) dissenting judgment in Chuckry v. Manitoba (Minister of Public Works) (1972), 27 D.L.R. (3d) 164,  3 W.W.R. 561 at paras. 34-36 (Man. C.A.). His dissent was subsequently adopted by the Supreme Court of Canada: Chuckry v. R.,  S.C.R. 694, 35 D.L.R. (3d) 607. (v) proportional area this method, which is similar to proportional division, attempts to proportion the area of the accreted lands in proportion to the original frontage on the riparian boundary. Mr. Allred concluded that in the case at hand, none of the methods seem to create a scheme of allocating the accreted lands to the benefit or satisfaction of the majority of the owners. In his opinion, the proportional division is usually the most equitable means of dividing up the lands. The application of other methods, such as projection of boundaries, could mean that the projected lines cross and some landowners lose their lake frontage. Duncan B. Gillmore, the land surveyor called by the Andriets, set out in his report that in his opinion, the most fair and equitable method to draw the boundary lines to the existing lakeshore would be to give each owner reasonable access to the lake, even if this means deflecting their property lines, and to give each owner a percentage of the total new shoreline, roughly being the same percentage he or she had of the previous shoreline. This method seems to accord with the proportional division described by Mr. Allred and which he suggested usually provided the most equitable means of allocation. The correct and more general rule is that the division of accretions should be equitable with a view to giving each proprietor a fair portion of accretions and access to the water, in view of the contour and location of the respective lands before the accretions were formed. There is Canadian authority that seemingly accords with this general principle. In Paul v. Bates (1934), 48 B.C.R. 473,  B.C.J. No. 95 (S.C.), two neighbouring riparian owners had competing claims to a triangular‑shaped piece of accreted land on the coast of British Columbia. The court adopted a Scottish precedent for the division of accreted lands: M Taggart v. MacDouall (1867), 5 M. 534 (Ct. Sess.). The method of division involved taking a map of the coast and drawing a straight line parallel to the coast (on the seaward side) that generally captured the slant of the receded coastline. A perpendicular line was then to be drawn from this slant line, and the perpendicular line was to connect with the original boundary line between the two riparian properties. While there was insufficient evidence in Paul to actually undertake this exercise, an application of this method would have resulted in property lines that deflected once they extended onto the accreted lands. I will later expand on the subject of division of the accreted land but before doing so, I address certain discrete issues between the Andriets and the County. They relate to the parcel of land that the County purchased in 1980 from the Lerbekmos for the roadway. It is necessary to address these issues at this time as they affect the directions which are required to be provided for the division of the accreted land. Issue 3: Do the lands acquired by the County for a roadway have riparian rights and if so, has the western boundary of the roadway parcel been extended southward as the lake has receded? The Andriets assert that the boundaries of the roadway parcel were fixed at the time of purchase so that the County did not gain riparian rights. On the other hand, the County asserts not only that the parcel has riparian rights, but that its western boundary has been extended as the lake has receded, such that the easterly boundary of the Andriet lands is not the lake, and their access to the water has effectively been cut off, so that they share little, if any, of the accreted lands, (see Appendix C ). These issues were not addressed by the trial judge having regard to his disposition of the litigation. The Court was urged by the parties to decide these issues, in the event that it was accepted that riparian rights are enjoyed. I am satisfied that the record of evidence at trial is adequate to permit these issues to be determined. The Andriets contention that the southern boundary of the roadway parcel is a fixed line is based upon the provision in the sale agreement that the south boundary is the Boundary of Cooking Lake as shown on the plan of survey 5231 NY by C. H. Weir ALS, 1967". They say that this description fixed the boundary as being the line shown on the plan of survey and that any ambiguity is resolved by evidence at trial which showed that when the parcel was sold, it was actually bound on the south by permanently dry land; i.e., there was a strip of land between the referenced boundary and the lake. Therefore, the existing bank of the lake was not the boundary. The County submits that the words in the sale agreement describing the south boundary do not fix its location at the line as surveyed, but simply make reference to the most current official plan depicting the location of the bank. In Flewelling v. Johnson,  2 W.W.R. 374 (Alta S.C.A.D. ), Beck J. noted that in surveys, traverses are made for a number of purposes, including defining the boundaries and the contents of a parcel of land fronting upon a river or lake, ascertaining the area of the portion of a parcel of land occupied by a body of water and connecting a point or line or a survey with another point or line of the same, or of another survey, or with some other reference object. He held that in the case of a lake, the courses of traverses are not the boundaries of a parcel fronting a body of water; the boundary is the bank, and the traverse merely serves to locate the natural boundary at a point in time, namely, at the time of the survey. I am inclined to interpret the words of the sale agreement in accordance with the County s submission. I also note that the evidence as to the actual location of the shoreline of the lake in 1980 is inconsistent and uncertain. However, my finding as to the southern boundary of the roadway parcel does not depend upon an interpretation of the sale agreement. The sale agreement is not a registered document. Following the County s purchase, the only documents at the Land Titles Office indicating the County s ownership of the parcel acquired for the roadway was the plan of survey registered as instrument no. 802 1713, which was recorded on the Lerbekmo certificate of title as an exception to the lands contained therein; (see Appendix B ). A person searching title would be required to examine the road plan to determine what was excepted from the Lerbekmo title. 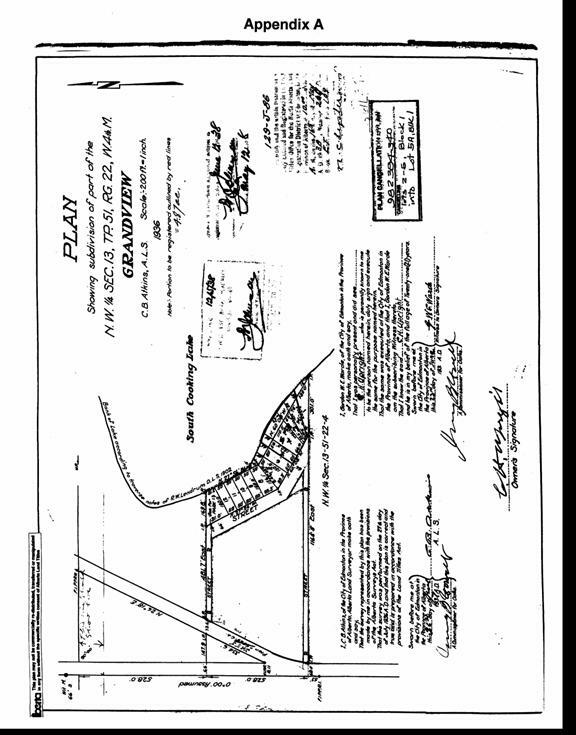 The registered plan of survey shows the southern boundary of the roadway lands to be the bank shown according to traverse by C. H. Weir, A.L.S., 1967, according to Plan 5231 N.Y. , and that the location of this natural boundary was approved as of July 9, 1980. Mr. Allred opined that Land Titles would not have registered an undulating boundary, as shown in the road plan, unless the boundary was a natural boundary. Mr. Gillmore, in his cross-examination, acknowledged that an irregular or curvy line, such as the southern boundary of the subject road plan, is not normally accepted by the land titles registration office, unless it is a natural boundary. Accordingly, the registered road plan clearly discloses that the southern boundary of the parcel purchased by the County is Cooking Lake. Mr. Gillmore, in his evidence, further acknowledged that the owner of a road plan with a natural boundary would be entitled to accreted lands. In our view, the land acquired by the County for road allowance is, like other titles bounded by water as its natural boundary, subject to loss by erosion or gain by accretion. Accordingly, the County has riparian rights with respect to the roadway parcel. ... and bounded on the west side by a southerly extension of the west boundary of the street right of way (the Street referred to is the first street east of Main Street in South Cooking Lake). On this basis, the County submits that the southerly extension of the First Street right of way extends over and through the accreted lands, and forms the eastern boundary of the Andriet lands. If this submission were accepted, the Andriets access to the lake would for all practical purposes be put to an end, and they would be entitled to little, if any, share of the accreted lands, (see Appendix C ). In order to resolve this issue, I turn once again to the registered road plan. It discloses the western boundary of the parcel acquired by the County. It makes no mention of any notional line running south from the First Street right of way as described in the sale agreement. The western boundary stops at the bank of the lake. The western boundary of the roadway parcel is a fixed boundary, as distinct from a natural boundary, and does not change nor continue to be extended as the waters of the lake recede. At the time of the County s purchase of the parcel for the roadway, a substantial portion of the lands retained by the Lerbekmos continued to front the lake and enjoyed access thereto. While the Purchase Agreement describes the western boundary of the parcel sold to the County as a southerly extension of the west boundary of the First Street , this southern extension must be interpreted only in relation to the boundary of the lake at the time of sale and as disclosed in the registered plan. The Purchase Agreement never assigned prospectively accreted lands to the east of the street right of way to the County. The lands from which the lake has now receded were covered by waters at the time of the sale and belonged to the Crown. The reference to the southerly extension cannot reasonably be construed as dealing with lands which may be accreted in the future, so to somehow extend the western boundary of the parcel beyond that shown in the registered plan. As will be further discussed, I accept the County s submission that an allocation of the accreted lands based generally upon proportional division is the most equitable. Accordingly, the Andriets will obtain continued access to the lake and their share of accreted lands, based on the amount of remaining shoreline as measured by the plan of survey described in their title, less the amount of shoreline of the parcel sold to the County as measured by registered plan 802 1713. Issue 4: Are the accretions to the lots in Plan 2611 bounded on the north by a line that is parallel to, and 8 chains south of, the northern boundary of section 13? This is an issue between the Andriets and the owners of the lots in Plan 2611. Once again, this issue was not addressed in the trial judgment having regard to the trial judge s disposition of the case. As I have determined that both the lands owned by the Andriets, as well as the Plan 2611 lots, enjoy riparian rights, it is necessary to provide directions with respect of this issue insofar as it affects the division of the accreted lands among the Andriets and the owners of the Plan 2611 lots, and also as it consequentially affects the division of accreted lands among the owners of the Plan 2611 lots. This Court has held that an owner s entitlement to accretion is limited by the legal description in the owner s certificate of title: Pitt v. Red Deer (City), 1998 ABQB 724 (CanLII), 1998 ABQB 724, 230 A.R. 396 [Pitt (QB)], aff d 2000 ABCA 281 (CanLII), 2000 ABCA 281, 271 A.R. 160 [Pitt (CA)] and Johnson v. Alberta 2001 ABQB 642 (CanLII), 2001 ABQB 642, 292 A.R. 263 [Johnson (QB)], aff d 2005 ABCA 10 (CanLII), 2005 ABCA 10, 361 A.R. 277 [Johnson (CA)], leave to appeal to S.C.C. refused,  1 S.C.R. xi. In each of these decisions, it was held that Alberta Township Survey System (ATS) lines referenced in certificates of title limited the accretion to which riparian owners were entitled. The ATS lines include township, section, quarter section and legal subdivision boundaries as set out in the Surveys Act, R.S.A. 2000, c. S-26, sections 18-28. The Andriets urge that the principle in these cases means that the boundaries between the top strip and the middle strip within the northwest quarters of section 13 are fixed such that the boundary is defined and applies to the accreted lands; i.e., the Andriets lands being a strip 8 chains wide, south of the north boundary of the northwest quarter of section 13, and the Plan 2611 lots being in the strip with its northern boundary fixed 8 chains south of the northern boundary of the northwest quarter of section 13 and the South boundary, 8 chains south of the North boundary. These two cases resolve the potential conflict between the certainty of title given by the Torrens System, which allows a purchaser to rely completely on the document at the Land Titles Office and the potential uncertainty introduced to that system by the haphazard addition of land to an owner s title by the common law doctrine of accretion. The solution is really quite elegant. The solution is essentially to say that a given title registered at the Land Titles Office has two types of boundaries. There are fixed immovable boundaries usually having reference to sections, townships, legal subdivision lines, quarter section lines and then there are movable boundaries, which are usually spoken of in relation to lakes and rivers. The solution is that the movable boundaries cannot pass over the immovable boundaries. This gives effect to the doctrine of accretion but still limits it to the maximum bounds provided for in the titles registered at the Land Titles Office. So, in Johnson it was found that accretion could not add lands outside the South West Quarter of Section 26 where the title said that the lands owned by the owner were contained within the South West Quarter of Section 26. This submission requires an analysis of these prior decisions and following that, a determination of the applicable principles and then their application to the issue at hand. It appears from the certificate of title that the Red Deer River had been situated on the northeast quarter of 13-38-W4th at some point in time. The trial judge found that the respondent could not gain accreted land outside of the northeast quarter of section 13, because his certificate of title circumscribed his interest as being within that quarter section (Pitt (QB) at para. 18). The trial judge gave no special status to ATS lines in this case. Rather, the trial judge focussed on the description in the certificate of title and it so happened that the limits in the certificate of title were ATS lines. This Court in Pitt described the issue thus: Does alluvial accretion inevitably extend the ownership of land beyond the original boundaries set forth in the Certificate of Title? (Pitt (CA) at para. 1). The court dismissed the appeal briefly stating the change of physical boundaries of the watercourse cannot create an expanded title overriding the boundaries of the title [the appellant] received (at para. 3). The focus both at trial and on appeal was the description of the lands in the certificate of title. The trial judgment in Johnson dealt with a reference question. Essentially, there were a number of parcels of land that had once bordered Buffalo Lake. The certificate of title of each parcel of land contained an ATS description (either quarter sections or legal subdivisions) followed by not covered by the waters of Buffalo Lake. The lake had receded to the extent that it was completely outside the various ATS descriptions. The issue as stated by the trial judge was this: can the changes in the boundary of a water body ... expand the Plaintiffs title beyond the boundaries of a section, quarter-section or legal subdivision referred to in the Plaintiff s certificate of title? (at para. 11). Thus, the issue was explicitly about the effect of ATS lines as set out in a certificate of title. s. 91 Every parcel of land described in a certificate of title consists only of the actual area within its legal boundaries and no more or less, notwithstanding that a certificate of title or other instrument that describes the parcel expresses an area that is more or less than the actual area. The trial judge observed that the language in section 91 suggests that the legal description in a certificate of title is binding on the holder (at para. 9), and that this binding effect is consistent with the legislative intent to create absolute title and provide holders of certificates with certainty in title (at para. 9). Ultimately, the trial judge expressed the view that she was bound by the decision in Pitt (CA), and the title to accreted land is limited to the legal description contained in a certificate of title (at para. 23). This Court affirmed the trial decision in Johnson, noting that the trial judge was correct in characterizing the issue as being not simply a matter of accretion, but rather a case of applying legally described boundaries under the ATS to define ... titles (at paras. 8, 16). Further, this Court endorsed the trial judge s finding that the doctrine of accretion can in no event extend the ownership of the appellants lands beyond the description in their certificates of title (at paras. 8,16). Except for the Andriets, all of the parties to the present appeal argued that the Pitt and Johnson decisions found that only ATS lines can limit the extent of accretion. Viewed narrowly, the ratios in these cases are indeed limited to ATS lines. However, this limitation appears to be a consequence of the fact that only ATS lines were at issue in both of these cases. Neither case considered how the use of non-ATS descriptions in a certificate of title could circumscribe accretion. Essentially, both Pitt and Johnson were applications of section 91 of the LTA (R.S.A. 1980)/ section 90 LTA (R.S.A. 2000). To say that section 91 applies only to ATS lines would be tantamount to saying that only ATS lines constitute legal boundaries as referenced in section 91. However, neither the LTA nor the Surveys Act defines legal boundaries. Viewed broadly, the decisions in Pitt and Johnson are more concerned with giving certainty to the descriptions in certificates of title, than they are concerned with ascribing a special status to ATS boundary lines. In fact, the Pitt decisions do not distinguish between ATS boundaries and non-ATS boundaries. Thus, applying Johnson and Pitt to non-ATS boundaries would appear to be consistent with the principle expressed in those cases. However, I am not required to make a definitive finding on this point because, as will be shown, the boundaries described in the subject certificates of title neither expressly nor by implication extend through the accreted lands. The certificates of title of the Plan 2611 lot owners do not describe a northern boundary fixed 8 chains south of the northern boundary of the northwest quarter of section 13. There is no mention of an east west line which notionally or otherwise would be extended as the lake receded. These certificates of title describe lot numbers with reference to Plan 2611. If one examines the Plan, the northern boundary is a line which extends to the bank of South Cooking Lake, and then stops (see Appendix A ). Once again, the southern boundary is defined by reference to Plan 2611 E.T. As noted, the fixed east west boundary line shown in the plan extended only to the bank of the lake. There is no more justification for notionally extending the line eastward as the lake receded, than for extending the western boundary of the roadway parcel southward as the lake recedes. This was an argument previously dealt with, and rejected. Here, the certificates of title both of the Plan 2611 lot owners and of the Andriets define the east-west boundary by reference to registered Plan 2611. An examination of Plan 2611, at least by a surveyor, would indicate both that the owners of the lands had riparian rights and the description in their certificates of title of their northern boundary in one instance, and the southern boundary in the other, is not determinative as to how the accreted land is to be divided among them. As the boundary shown in the plan stops at the bank, it must be inferred that in the event of accretion, the accreted lands will be divided in accordance with common law principles governing divisions of accreted lands. In other words, the boundary will be extended across the accreted lands in the fashion governed by the common law in situations where accreted land is divided among neighbouring properties. It should be added that reliance upon a certificate of title with an east west line, that runs all the way across the quarter section (i.e., 8 chains south of the northern boundary), requires one to make an historical search all the way back to the certificate of title issued to Charles Upright in 1935. It violates fundamental Torrens principles to require that owners find their right in prior titles. As the trial judge noted in Johnson (QB), the legislative intent underlying the Land Titles Act was to create absolute title and provide holders of certificates with certainty in title (at para. 9). There appears to be no principled reason to limit the accretion of the Plan 2611 lots by reference to a line that is a parallel line and 8 chains south of the northern boundary of the section. The same principle is applicable, of course, to the Andriets, so that there is no principled reason to limit the accretion to their title south of such notional boundary in the event that the principles governing the allocation of accreted lands so provide. McGowan claims land south of his property and located within the northwest quarter of section 13 on the basis of adverse possession. He asserts that the trial judge erred in failing to find that exclusive possession of the path, and the lands within it, had not been proven by him on the balance of probabilities. The trial judge adopted the test for adverse possession as explained by Dea J. in Edwards v. Edmonton Beach Resorts Ltd. (1992),130 A.R. 375,  A.J. 572 (Q.B. ), which requires that exclusive possession be proved. The trial judge found on the evidence that the lands claimed by McGowan were commonly used by other area residents. He concluded that the element of exclusive possession had not been proven on a balance of probabilities. This is a finding of fact. McGowan has not demonstrated any palpable or overriding error with respect to this finding. His cross-appeal is therefore dismissed. The Andriets, the County, and other Plan 2611 lot owners joined in this action are declared to have riparian rights. The accreted lands are to be divided in an equitable fashion, preserving to each owner access to the water. The accreted lands will be divided so as to provide each owner, so far as reasonably practicable, with their proportionate share of the shore of the lake as disclosed by the plans referred to in the existing certificates of title relating to the subject lands. More particularly, the proportionate share of shoreline will be based upon the length of shoreline as shown in the registered plans at the time the parcels or lots were initially created and registered. In the case of the Plan 2611 lot owners, the length of shoreline will be the length that each lot had of the 1936 bank of Cooking Lake. In the case of the Andriets, the proportionate share will be based upon the length of shoreline as measured by the plan of survey dated May 19,1903, as referenced in their certificate of title, less the length of the shoreline of the roadway parcel acquired by the County, as shown in the registered plan no. 802 1713. The County s proportionate share will be based on the length of shoreline as measured by that plan. In short, I would simply total the amount of shoreline that the parcels or lots had at the time of their registration, making the deduction for the sale to the County in the case of the Andriets, based upon the surveys of the bank of the lake at the relevant times, and then attempt to provide each current owner with their proportionate share. As the lake has greatly receded and the shoreline substantially reduced, it is obvious that the proportionate shares of the existing shoreline will be considerably less than the shorelines shown in the earlier surveys. I appreciate that there is a certain imprecision, and perhaps imperfection, in the method by which I have directed for ascertaining the proportionate shares of the shoreline of the lake as it now sits. This imprecision arises because the plans were registered at different times. However, while subsequent purchasers obtained rights to accreted lands, the exact portion and boundaries were left to be determined by registration of a registerable plan at the Land Titles Office. As a matter of basic fairness, I do not see any cause for complaint amongst the owners in the circumstances of this case, if the accreted lands are now divided proportionally, having regard to the length of shorelines shown by the registered plans referenced in the subject certificates of title. It is those registered plans upon which the owners relied when they purchased the parcels or lots, as the case may be. The Torrens principles are honoured in the process. For reasons that are obvious when Appendix C is examined, the directions provided herein for allocating the accreted lands mean that perpendicular or straight property lines cannot always be maintained and that many property lines will be required to be deflected to achieve an equitable division. As a consequence, some irregularly shaped parcels can be anticipated to be formed. While, generally speaking, the method of allocation is to be proportional division as described in the expert testimony, there is no need for slavish adherence if the result will create anomalies and other inequity. In other words, the methodology is to be applied in such a fashion as to reduce irregularities and to promote equitable division so that the owners maintain their riparian rights to the fullest extent practicable. Professional judgment of expert surveyors, with full knowledge of the topography and other relevant considerations, will be required to be exercised. This Court does not, of course, have the expertise to draw the property lines. However, we are hopeful that our findings and directions are adequate so that the interested parties can agree to instruct a common surveyor to prepare a registerable survey dealing with the accreted lands. As a matter of common sense and prudence, I would urge that regard should also be had to how the new property lines may be extended as the lake continues to recede. If the parties are unable to reach an agreement as to how this judgment is to be implemented, including the drawing of the new property lines, within 90 days of the delivery of this judgment, then the matter is referred back to the Court of Queen s Bench. In that event, the parties are directed to seek case management, so as to expedite proceedings to complete this matter. A judge of that court will ultimately hear such further evidence as he or she considers to be appropriate and will then direct an allocation in accordance with the findings in this judgment. Once again, I am hopeful, in light of these findings, that the parties will be able to reach agreement as to costs. If they do not do so and no agreement is reached as to the implementation of this judgment so that it is necessary to refer the issue back to the Queen s Bench, then such trial judge who deals with the issue is authorized also to provide directions as may seem appropriate and proper for the costs of the trial, appeal, and further hearing. If there is agreement as to the implementation of this judgment, such that it is not necessary to refer to matter back to the Queen s Bench for that purpose, but there is no agreement as to costs of the trial and appeal, then the parties may make submissions to this Court in that regard. In that event, counsel should contact the case management officer in Edmonton to make arrangements and to obtain directions for scheduling written submissions and replies dealing with costs only. Any application to this Court seeking directions as to costs must be made not later than 90 days from the date of delivery of this judgment. If the case management officer has received no request for an adjudication of costs within that time frame, the matter will be considered to be concluded.